In short, can you test my Groundnet? 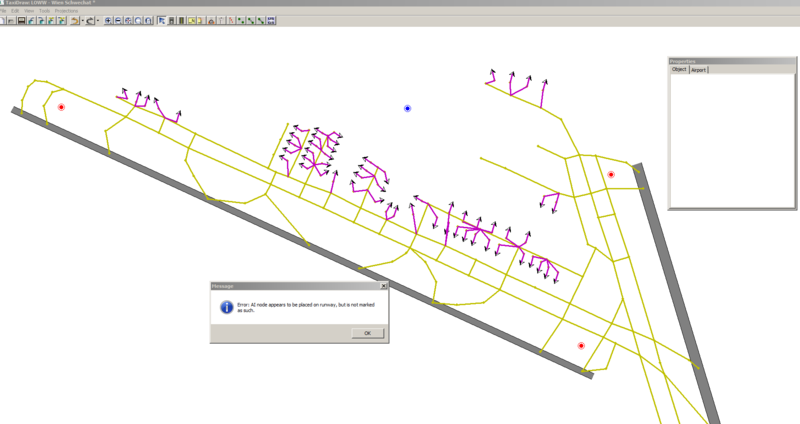 The original Groundnet has only parkings and thus the AI Traffic does not work. 1) The Groundnet of media.lug-marl.de/flightgear/7976groundnets.tgz has taxi routes but they are not complete and have errors. 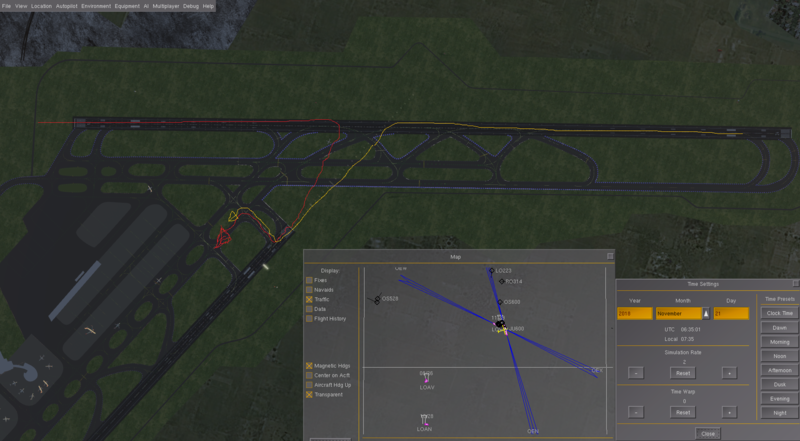 With Taxidraw one AI node appears to be placed on runway but not marked as such. Have the groundnet corrected. Has no bugs on verify ground network now. 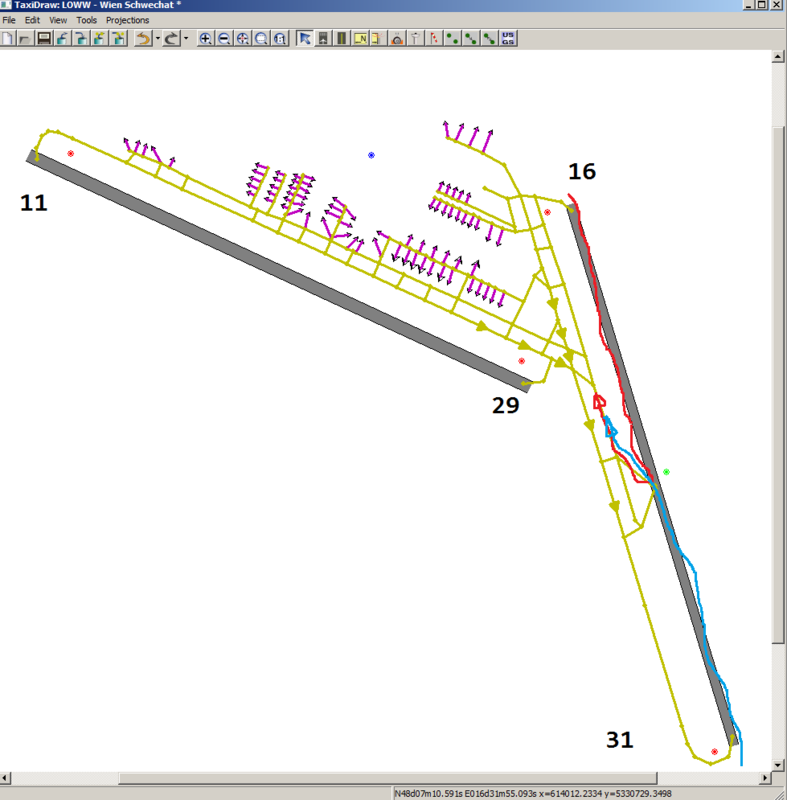 2) I created more parkings / taxiways for the groundnet of media.lug-marl.de. There were too few for the AI ??traffic. It's not perfect yet, but it's better than nothing. 3) Now to my problem. Black line: Here are taxi some aircrafts. But most of them are moving on the red line. I have added a new taxi road, but he plans do not use it? b) Then i removed for a test a taxiline: You see it as red doted spots. But now the aircraft using now the black line! (This is not the shortest way to the runway). Here is the zip file for the groundnets. May you can help me and check the Groundnets. I am having a look at v17 and can confirm there is no obvious technical problem with your BUT it could definitely be optimized, here are some avenues. These are based on my experience and observations given we have zero documentation on the behaviour you should expect from AI trafic code. 1. Way too many routes. As you noticed AI traffic does not really compute 'alternative' routes and will insist in using the 'most efficient route' rather than the shortest, based on some mysterious logic (I guess in your case something like "Go East as much as possible for as long as Going north does not take me closer to threshold". 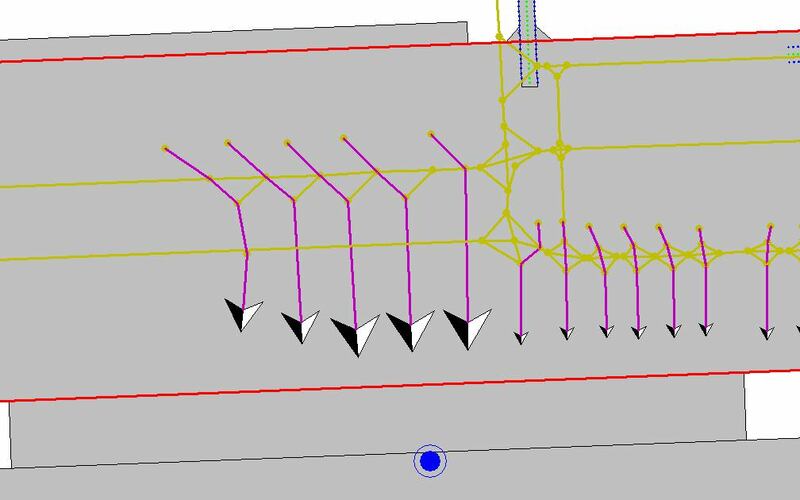 Groundnets work best with a simple unique route between each apron and each threshold. 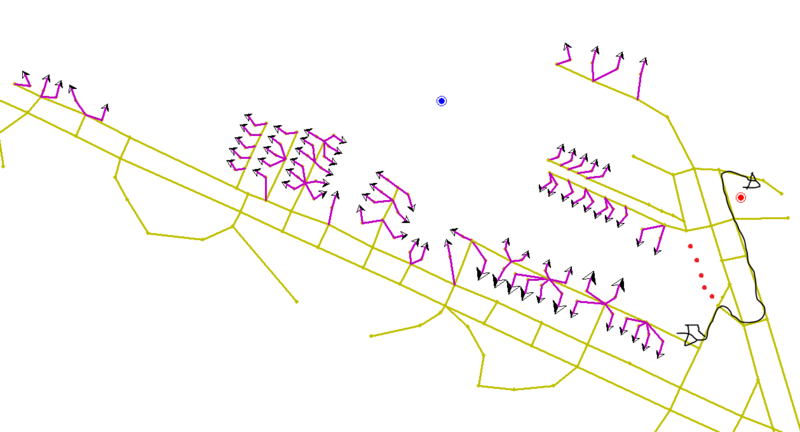 The way I normally achieve this is by forming a series of 'loops' of taxiways. Wherever two loops connect aircrafts can jump from one loop to the other so the 'friction' point between two loops behaves a bit like a touch point between two cog-wheels (if it makes sense). 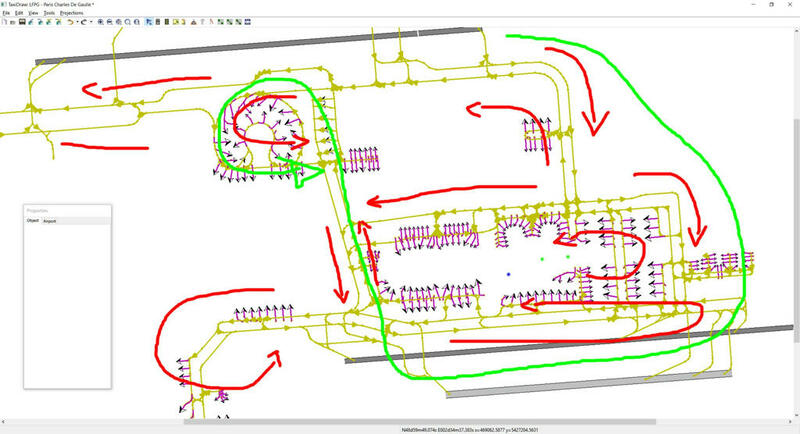 Each apron access point is connected to a single loop (same for each threshold. As a result all the aircrafts 'pile up' one behind each other on each loop and give way (or jump loop) at touch points. Departing aircrafts join the runway at the node closest to the threshold (as defined in APT.DAT so for example your B2 taxiiway is useless for departures. Arriving aircrafts tend to roll forever on the runway after slowing down and NOT vacate the runway as soon as possible. In my case I am able to get them to vacate before the end of runway (threshold) but rather close to it and never halfway through. 4. Overall Approach to GN : You should always start with a single apron/parkpos and ensure your aircrafts are reaching all thresholds properly. Then and only then you can add more parkings. It is much easier to troubleshoot why routes are wrong with a smaller number of 'options' for aircrafts to travel. Because as I said before AI does not handle 'alternative route' adding more aircrafts or taxiways will not change the way they behave, only make you more frustrated. Oh, havn't known that someone update LOWW. So I can be a little bit late, but i have updated the parking positions on LOWW on my local FG. 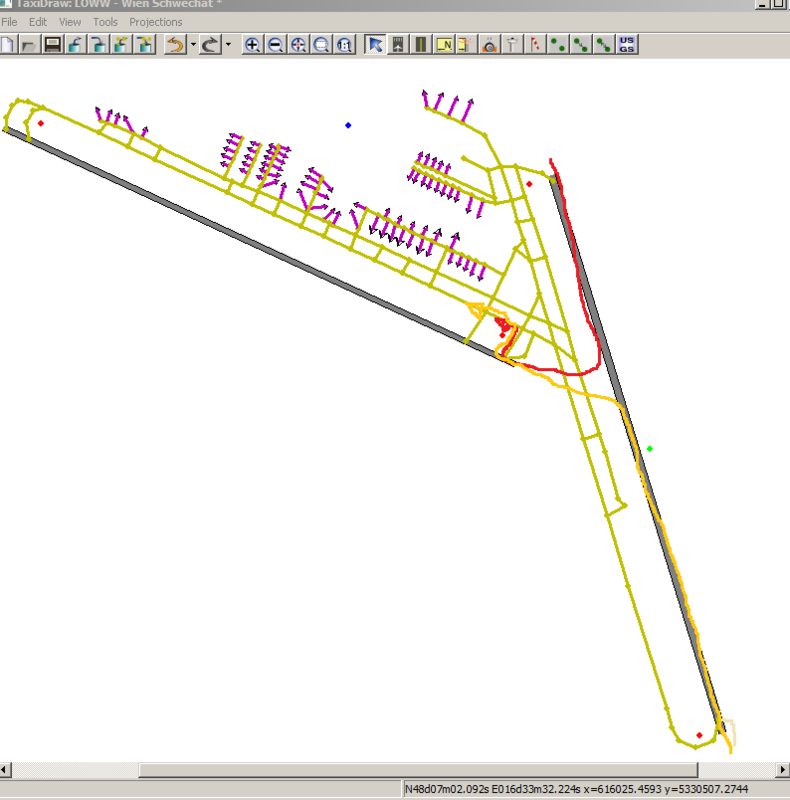 I have also the actual airport layout imported in AutoCAD. If you need coordinates from a specific point, let me know. At LOWW there are parking positions sharing the same space. As example position E48 and E49 are side by side for little airplains, but E97 is for big airplains and occupy also E48 and E49. How intelligent is the AI logic to work this out? If E48 is occupied, also E97 is occupied and only E49 is free. If E49 is occupied, also E97 is occupied and only E48 is free. If E97 is occupied, also E48 and E49 are occupied. I am not sure, because nobody can ready the c++ logic for AI. But i have seen that aircrafts are overlapping with the wings if the Wingspan Radi allow it. Let's try to explain it to a thought example. We start the FG at 6:00 o'clock. In the traffic file (AUA.xml) start a lot of aircraft in this time range. The aircrafts will be positioned in the parking lots depending on the wingspan. It can then happen that all 3 parkings are occupied. In the worst case with a 747 in the parkinglot E97 and two A320 in E48 and E49 . Then the wings overlap. Thats it. I guess that there is no AI logic for that item. powoflight wrote in Fri Nov 16, 2018 7:24 am: I am not sure, because nobody can ready the c++ logic for AI. Well, in fact the AI Parking Selection Logic is the one clear thing in AI. What aircraft goes where depends on GateType (Cargo vs Passenger, mandatory), Airline Code (Optional) and Wingspan (mandatory). Beware FG works with radii, not diameters hence a Boeing 777 can occupy any parkpos with radii 33 and larger and an E95 will occupy any spot with radii 14 and above. I have two more questions, where I'm not sure if I got it right. Do you mean that? Because i am a little confused about "middle of runways"
I hope I got it right. It should be like SVMI? The 3 points on TaxiLane 40 orange can be removed. Please also resist the temptation to place "Holding Points" nodes of type 'normal' or 'CAT II/CAT III' I never saw any of these have any effect. - Departing traffic will always enter runway at threshold (unless there is not taxiway to get there like at very small airports and rolling on the runway is the only route to get to the threshold. - Arriving aircraft will not vacate the runway halfway through ('in the middle of the runway'). you could try to re add these points at a later stage, once your minimum GN works, just to see if they have an impact on incoming traffic but I doubt it. You can have the pushback route overlapping the taxiway (see 7th position from the left on your SVM screenshot) for aesthetic reasons but it has to be a separate route. 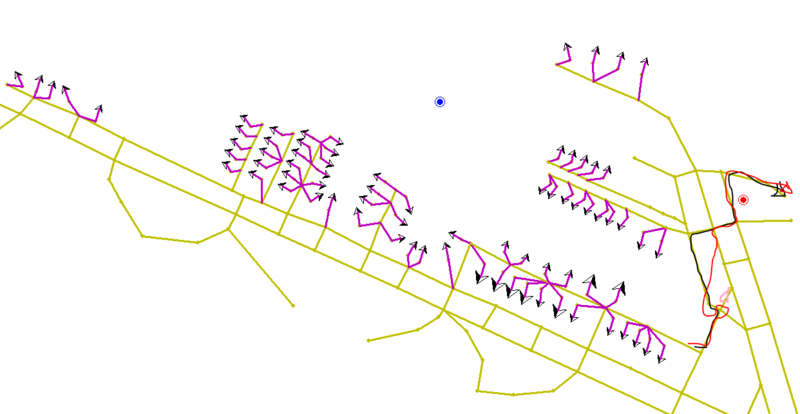 Also note how each Parkpos has its individual pushback route. What you have in your GN at ParkPos F01-F23 is pretty bad (and unrealistic) chances are none of these aircrafts will ever move cause they all compete for the same shared node out of their respective parking. I've come into this a bit late but here's a few disjointed notes about groundnets to add to what Ian has written. There are still a lot of bugs in the AI groundnet system, some of them are intermittent so what works in one place does not work in another. Aircraft don't return to a parking position they always stop short, likewise they never seem to go the full length of a pushback route. There has been a slight change in the AI behaviour from a few years ago, tight pushback routes that I used to use no longer work, also it seems that AI like to cut corners and don't always go to the next node on the route but just makes it's way directly to the runway. 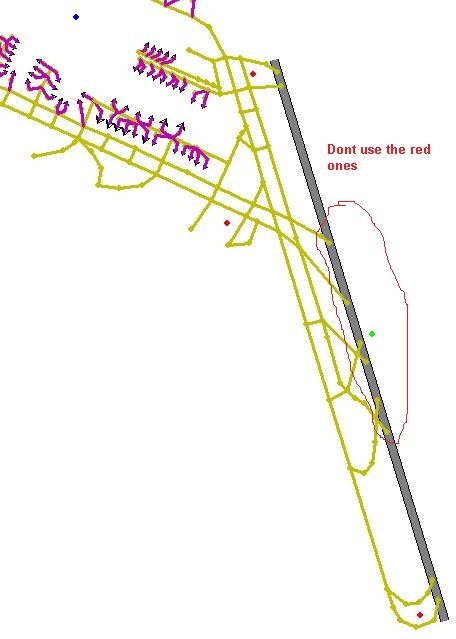 If a parking position is 'unidirectional' and between the main terminal parking and taxiway AI will taxi through these positions even if there is an aircraft parked there. Avoid sharp corners, if you need to turn more than approximately 100 degrees put another node in to smooth the turn. All final routes to and from a parking position should be directly in line with the parking position heading. 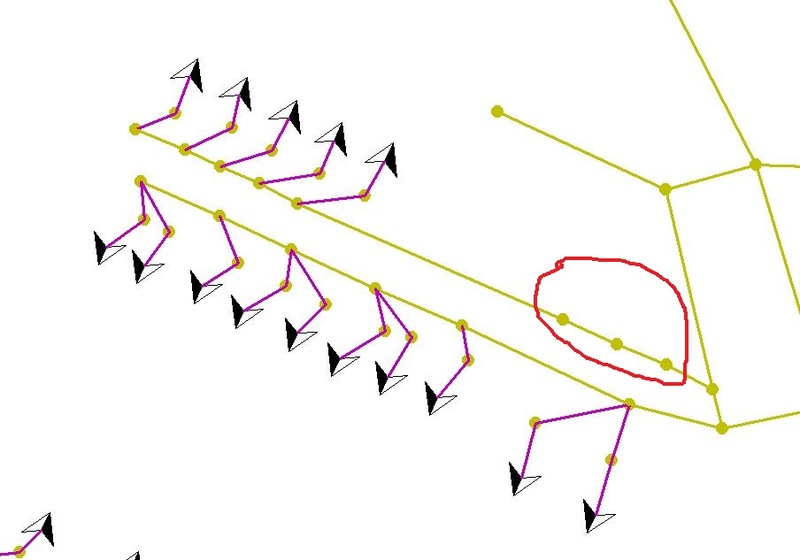 Avoid using triangular junctions if possible use a T or X junction instead unless the angle is to great, triangular junctions confuse the AI routing causing aircraft to rotate around these before proceeding on their way. On runways where the aircraft have to taxi on the runway and turn at the end before take off only mark the last node as 'Onrunway'. 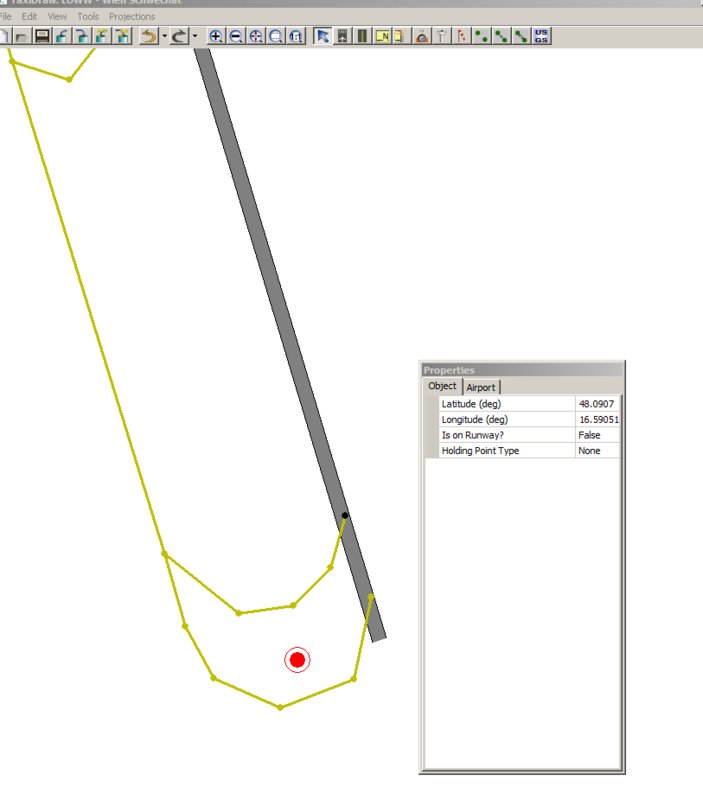 I've also got a groundnet for LOWW That I created years ago, pre pushback and old radius settings but still works well. Thanks a lot for your infos. But unfortunately, I have two more questions. 1) I tried to improved groundnet LOWW and by checking the groundnet i have seen, that arriving aircraft on the runway 16/34 not taxi to the end, but in the middle taxi directly to the runway 29 via grass. Maybe AI thinks this is the shortest way to the end of the runway? 2) I tried to check runway 29/11. I changed the wind direction in the launcher. In both wind directions aircraft take off and land from the runway 34. I tried to improved groundnet LOWW and by checking the groundnet i have seen, that arriving aircraft on the runway 16/34 not taxi to the end, but in the middle taxi directly to the runway 29 via grass. I've just spent several days trying to get pushbacks to work at LIRP, which has traffic taxiing on the runway to one end before take off, until I marked all nodes on the runway as 'onrunwy', that's one rule out of the window! Next problem was, like yours, incoming aircraft leaving the runway mid point and taxiing to the nearest node which just happened to be on the adjacent runway. Cured that by adding a mid runway off ramp route to the groundnet, another rule out of the window! After fixing that I now found pushbacks had stopped working! That was cured by moving a couple of 'onrunwy' nodes a fraction. I have come across this several times before when pushbacks don't work and have no idea why this fixes it but it usually does. Try adding an off ramp at mid point and see if that helps. All this goes to show just how haphazard AI behaviour is. I had no time but now I can deal with the groundnet loww again. It's not perfect yet, but incomming aircraft works now on 16/34. There is a problem to check Runway 29/11. I will open a new forum entry. See too 2) I tried to check runway 29/11.